I worry this is what people are doing waiting for new Too Many Chickens! posts. Tap tap . . . is this thing on? It is on! More new episodes coming February 28th! Not long now! If you’re stuck inside from the cold . . .
Why not try teaching your chickens some tricks? How are you handling the cold? 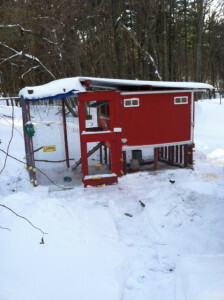 Is everyone keeping their chickens warm in the Polar Vortex? Mine stay outside without any source of heat but themselves, and have been fine. The key is to have ventilation to keep the moisture from hanging around. I have had to bring one inside at night, since she seems to think molting in winter during a cold snap is a sensible thing to do. She should be all re-feathered shortly, and then can have sleepovers with her friends. Came across this video today. I agree that maybe chickens aren’t as smart as dolphins or pigs, but sheesh, lighten up, Werner. Well, not really. We got maybe 8 inches, way less than other parts of the state. It also drifted a lot, so it didn’t even build up on the coop roof that much. Let the wind do your work for you! The downside of the wind is that it blew snow directly into Boss Chicken’s hutch. Luckily, she wasn’t in there, since she comes in at night in the winter. 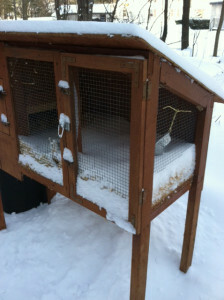 The hutch doesn’t give enough protection for the cold temperatures. Like a ski slope in your house!